The winter can come and the long dark days. I’ve a new toy in my collection. After a long time I have the heart to test a new object. 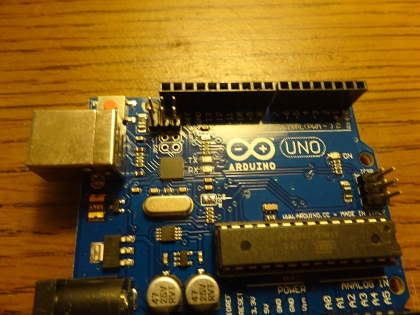 It’s an Arduino, precise an Arduino Uno It’s a little microcontroller that you can program something in order to see with what a LED does. You can construct a blinking light or other things. I’m be straining at the leash to do the experiments. This evening I only set up the software with Fedora. Of course I will set up the other software for my other computer what I have. I cannot believe that I only to the experiments in the living-room. 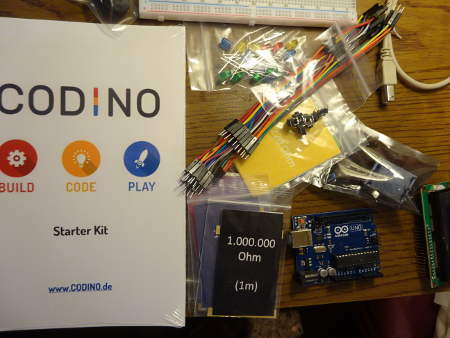 The project where I have bought me, it’s called Codino. The two men who sell this project have collected a lot of useful things into a small nice white box. The Codino with all useful things for a new experience for me. By the way: The program language for the Arduino is C/C++. That is standing in the manual. Dieser Beitrag wurde unter English, Linux abgelegt und mit Arduino, Codino, Fedora, Fedora25, LED, microcontroller, Winter verschlagwortet. Setze ein Lesezeichen auf den Permalink.